BOSTON – Collette Divitto is now running her cookie business around the clock, CBS Boston reports. 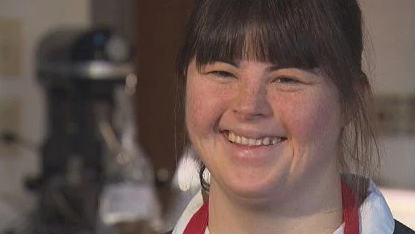 Since the station profiled the 26-year-old late last month who was born with Down syndrome, she has received orders for more than 25,000 cookies around the country. Divitto started the business after she faced barriers trying to find a paying job. Her hope is to grow the business and eventually hire other people with disabilities. Divitto’s first client, the Golden Goose Market in Boston’s North End, is now lending its kitchen space and industrial equipment to help her keep up with the incredible demand. Some employees are also working overtime to assist the business owner. On Thursday, Divitto and her helpers baked more than 500 cookies. Manager Jesse Powers said he’s been fielding calls from Florida and California from people wanting to place orders. Businesses have also expressed an interest in selling the cookies. Others want to offer them at upcoming holiday events. On Saturday, she will be handing out samples at the Boston Ugly Sweater Crawl. Several people have also reached out, wanting to discuss possible investing opportunities. Aside from the online orders, Divitto’s mom, Rosemary Alfredo, said the family has been trying to keep up with hundreds of supportive emails. Some of the messages have even come from overseas. “It’s been so uplifting to see the love and compassion across the world,” Alfredo said.